Cheryl Brown has been the Head of School since 2014, but has earlier worked at St. James as Business Manager and CEO. Cheryl’s education is in Business Administration and she holds a Masters Degree in educational Leadership. Cheryl grew up in the Midwest, and then lived in Southern California until her family relocated to Texarkana in 1994. She has one daughter and two grandchildren who are graduates of St. James. Cheryl finds St. James a family that believes in caring for one another—faculty, staff, students and their families. She strongly believes in our philosophy of teaching the whole child: body, mind and soul. She has served on several Accreditation teams for the Southwestern Association of Episcopal Schools. More locally she is involved with Leadership Texarkana and a Sustainer of the Junior League. Cheryl’s activities include traveling and spending time with her grandchildren. Traci Anderson has served as Director of Curriculum and Assessments since 2014. Prior to that, she worked for four years as a dyslexia specialist at the school. Before coming to St. James, she worked at Texarkana ISD as Coordinator of Behavioral Interventions and earlier as Director of the Therapeutic Intervention Learning Center. Traci’s three daughters are all graduates of St. James Day School where they received an excellent educational foundation. Traci is a trained Orton-Gillingham teacher, and a member of the National Association for the Education of Young Children. Shannon Kirkland is Director of Innovation and Academic Technology. Shannon worked at Texarkana ISD for 15 years where she served on the administrative team as Coordinator of Instructional Technology and Robotics, both at the Secondary and Elementary levels. Previous to these posts, she was a Gifted and Talented teacher and special education teacher for TISD. She was Instructional Technology Specialist of the Year for Texas Computer Education Agency and a TISD Teacher of the Year. A TCEA certified Instructional Technology Facilitator, she is a trainer for NASA NoS, Mimio, Lego Robotics, a ScratchEd educator and a Google CS First mentor. She is a member of the International Society for Technology in Education, the Texas Computer Education Association and the Computer Science Teachers Association. She is also a current Continuing Educator Community Education through Texarkana College. Shannon is excited to offer Tech-Know Tuesdays to our students, where they are introduced to cutting-edge technologies that extend the classroom learning environment to after school learning and inspires students to become tech gurus! She also offers Sci-TECH Saturdays to St. James students and the wider community. Shannon's two sons, Jacob and Mason, and Henry Dean graduated from St. James. She finds St. James a nurturing and loving Christian environment where students can succeed at their own pace and at their own level. Apart from work, Shannon is a member of the Civil Air Patrol and Associates of Graduates of the Air Force Academy. Keri Pompella is in her first year as Administrative Assistant at St. James. Prior to coming here, Keri worked for the Girl Scouts, where she was in charge of merchandising at the council office. Through Girl Scouts she worked with girls in local school districts. A native of Texarkana, Keri previously worked at the Girl Scouts and Pleasant Grove Baptist Church. Her educational background is in merchandising and business administration. When she is not at work, Keri enjoys crafting, sewing, junkin’ and discovering new places. Susannah Joyce has taught at St. James for six years, initially as third grade teacher, and for the past three years as sixth grade teacher. This year Susannah will be joining the Admin Team by supporting her fellow faculty and helping with school communications. Her two daughters are graduates of St. James, and her husband too is a St. James Day School alum. A native of Texarkana, Susannah is a graduate of TCU, and worked in Human Resources before returning to school to earn her teacher certification. For Susannah, St. James is a place where the priority is on educating the whole child and fostering self-confidence and problem solving to be effective and successful people. Apart from work, Susannah plays tennis, travels and is involved in her children’s various activities. Diane Johnston has taught preschool for 22 years, 15 of which have been at St. James. She is thankful that St James is a place where she can share the love of Jesus Christ with her students. A native of Texarkana, Diane has an educational background in history and the arts, and child development. Diane reads, spends time walking, and sings in her church choir. Sarah White is the PreK 3 teacher at St. James Day School. A lifelong resident of Texarkana, Sarah’s educational background is in biology and wildlife ecology. It was through her work as a wildlife interpreter that she realized the benefit of hands-on education. Sarah loves working with children, and helping them grow into successful leaders. She finds St. James a loving, supportive environment, where the whole child is taught: mind, body and heart. She appreciates the meshing of foundational areas such as cursive and phonics with new and exciting subjects such as robotics and coding. A mother of twins, Sarah looks forward to them attending St. James Day School this year. Apart from being a wife and mother, she enjoys spending time with her extended family, reading, knitting and outdoor pursuits such as fishing, hiking and camping. Sarah helps with the children’s program at her church, and currently volunteers with For the Sake of One, a non-profit ministry that works with foster children and families in Bowie, Cass, and Miller counties. Amanda Hayman is PreK 3 3 Day teacher at St. James Day School. For the past three years she has worked with all the teachers and children in the preschool building as an aide. Amanda received her child development certification through Texarkana College, and serves as co-director of the Summer @ St. James program. Amanda loves the family atmosphere of the school and the opportunity to teach her children about God as part of their education. Lisa Norton has enjoyed teaching at St. James Day School for three years. Before teaching at St. James Lisa taught third grade and Pre-K. Lisa received her BFA from Trinity University, San Antonio, with an emphasis in Speech, Drama, and Education. Upon graduation from college, she continued her study of theater at The Neighborhood Playhouse School of Theater, NYC. Lisa is the proud mom of two St. James alumni, James and Claire. One of her favorite things about St. James is the creative, "hands-on" environment she is able to enjoy. Tracy Jones is in her 8th year at St. James, currently as the Pre-K teacher. Before coming to St. James, Tracy worked in the public education system for 11 years. A native of Queen City, Tracy was educated at Texarkana College and Texas A&M University, Texarkana. She has a stepdaughter who is a St. James graduate. Tracy appreciates the Christian atmosphere of St. James, where students are loved and nurtured in a family-like environment. She loves reading, cooking and spending time with family and friends at her river cabin. Tracy serves on the Vestry of St. James’ Episcopal Church. Now in her fifth year at St. James, Sarah Kyles is the Kindergarten teacher. A native of Camden, Arkansas, Sarah graduated from Texas A&M Texarkana. Before coming to St. James, Sarah worked as a Kindergarten teacher at a local private school. Sarah has one child currently at St. James, and two children who are graduates. She loves watching children grow throughout the years, and as a teacher finds St. James a place where the individual needs of each child can be addressed. Sarah spends her time outdoors, running and camping with her family. She is a member St. James’ Episcopal Church. Now in her sixth year at St. James, Claire Gordon is the first-grade teacher. A native of Texarkana, Claire has worked with children for most of her life, first as a babysitter, and then in a local daycare. She has always been fascinated by child development. A certified early childhood educator, Claire was educated at Texas A&M University, Texarkana. She has one child, and very much looks forward to him attending St. James in a couple of years. Claire is thankful that St. James is a place where she can openly teach children about God. She cherishes the community feeling of school, and the ability to use play and the outdoors in her teaching. Claire reads, spends time outdoors and enjoys photography. She is a member of First United Methodist Church in Texarkana, Arkansas. Stacy Wade has been a certified teacher for the past eight years and has taught PreK, 1st, and 4th grades. Mrs. Wade is excited to teach 2nd grade at St. James Day School this year. She said that “being part of the St. James Day School family is such a blessing and the best thing about St. James Day School are her students. They make walking into school each morning a joy!” When Stacy isn’t at school she loves to visit new places, travel to the beach, enjoy music at concerts, and spend time with her family and friends. This will be Summer Burkes first year to teach at St. James Day School. Summer comes to St. James with over eight years of teaching experience. She has taught Kindergarten, First, and Fifth grades and is looking forward to teaching Third this year. Growing up, her mother owned a dance studio and she began co-teaching with her at an early age. From this experience, Summer always knew that teaching was going to be her passion. Summer has a Bachelors Degree in Early Childhood Education from Southern Arkansas University. Mrs. Burkes is a busy mom of three, two of which are old enough to attend St. James. Summer loves the flexibility and various teaching methodologies at St. James, and appreciates that the focus is always on learning. When Summer does have free time, she enjoys individual sports, watching college football, traveling, painting, camping, attending church, and spending quality time with her family. Pat Wagy is the senior teacher at St. James, having taught for 46 years, 34 of which have been at St. James. Pat’s goal is to help children develop a life-long love for learning in a happy and safe environment. She enjoys the freedom to teach, the family atmosphere and the wonderful people that are part of St. James. Jennifer Jordan is in her seventh year of teaching at St. James, currently as the fifth grade and Latin teacher. Jennifer grew up in Setauket, Long Island, whose claim to fame is that it was the home of George Washington’s spy ring during the Revolutionary War. Before discovering her passion for teaching, Jennifer practiced as an attorney. She was educated at Washington and Lee University, and the Catholic University of America. Jennifer’s daughters both attend St. James, one in the sixth grade and one in the third. As both a parent and a teacher, she appreciates the small Christian environment of St. James which focuses on and cares for the whole child. She is a Sustainer in the Junior League, a member of Texarkana Law Wives, and St. James’ Episcopal Church. Her interests outside of work include spending time with her family and friends, reading, walking and baking. Mrs. Ayers has a B.S. in Chemistry and Chemical Engineering from Purdue University and M.S. in Curriculum and Instruction from TAMUT. She was the 2017 Ross Perot STEM academy T-Stem Teacher of the Year. Her professional development includes National Network of State of Teacher of the Year – Social Emotional Learning (SEL) Fellowship, NASA Network of States Train the Trainer Institute at Johnson Space Center, and Consortium of State Organization for Texas Teacher Education-Emerging Scholars Track. Mrs. Ayers is excited about the opportunity to teach the St. James Middle School students math and science and to help design these programs for the new 7th and 8th grades being added. Gale Malone has taught at St. James for 28 years. She has made wonderful friendships here throughout the years, and finds coming to work every day a true joy. Gale has held many positions at St. James; she currently has administrative duties and serves as teacher sub. Gale is a Texarkana native, and is certified in early childhood development. Watching children grow and develop their skills as they travel their educational journey is her greatest pleasure. Outside of work, Gale reads and listens to music. For many years she was in a ladies’ singing group. Maria Perri joined the St. James Day School faculty this year. Maria grew up in Guerrero, Mexico, in the small town of Coyuca de Catalan, and then moved to California where she met her husband, Michael. They eventually moved to Texarkana where Michael accepted a teaching position at Texas A&M University-Texarkana. 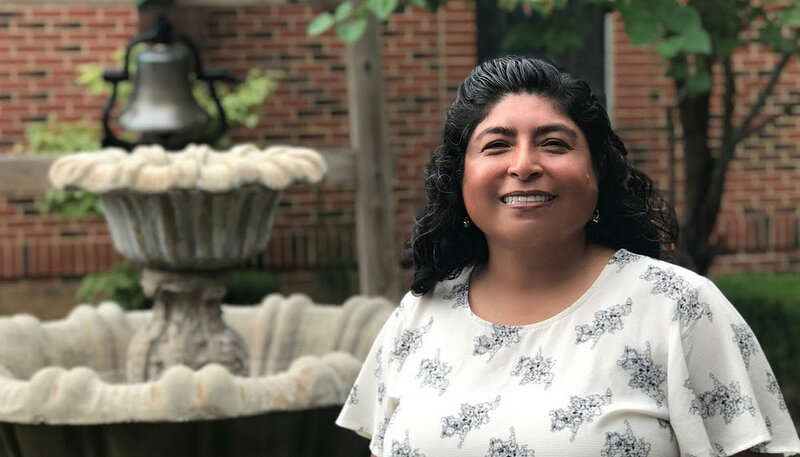 Moving to Texarkana gave Maria the opportunity to return to school and earn an Associates of Arts degree from Texarkana College and a Bachelor of Science Degree in education at Texas A&M University-Texarkana. Before coming to St. James Day School, Maria taught a bilingual kindergarten class. Maria spends her free time watching her two daughters play soccer and traveling to California and Mexico to visit friends and relatives. Maria says that she is excited to be at St. James Day School because teaching is her passion and St. James students love to learn. Melanie Tipton is the music teacher St. James. She finds our students to be quite talented! Melanie grew up in Little Rock, and holds a BA in voice from Ouachita Baptist University and a Master of Music in vocal performance from the Southern Baptist Theological Seminary. Prior to her arrival at St. James, Melanie was a professional singer, and taught in private and parochial schools in Louisville, Kentucky. She is a member of the National Association of Teachers of Singing, the Music Teachers National Association and the National Federation of Music Clubs. Nicole Chatelain has taught Physical Education at St. James Day School for 14 years. Her son Jon is a sixth grade student at the school. Nicole is a graduate of Southern Arkansas University with studies in kinesiology and health. She is a certified heart first aid and CPR instructor. Nicole is also the director of the After School program, and co-director of Summer @ St James. McCarly DuBois is new to St. James this year and she is very excited to be teaching art in the school setting again. She was born and raised in Texarkana, Texas. She previously taught elementary art at Gardenview Elementary School in Memphis, TN. Upon moving back to Texarkana, she took the position of adjunct faculty at Texas A & M University, Texarkana, teaching Art Appreciation. When it was time for her second daughter to arrive, she retired from that position. She attended St. Edward’s University in Austin, TX, and graduated with a Bachelor’s of Science Degree in Psychology with a minor focus in Art. McCarly also attended graduate school at the Memphis College of Art and graduated with a Master’s of Arts in Teaching. McCarley appreciates that the students at St. James care about their education and they care about each other, and she feels there is nothing more encouraging to an educator. She and her family enjoy exploring the outdoors, listening to good music, and being active. McCarley is a member of the National Art Education Association and she is on the Women of Hope Committee for CASA of Texarkana.